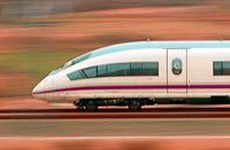 In Spain all high speed trains run over tracks in a special built high speed network. No disturbing influences have to be taken into account for daily operation process. This is a great advantage. Spain shares this advantage with the high speed rail networks in Japan, Taiwan and China. Running trains on parallel train paths and at least from case to case in 3 minutes headway to each other is a basic condition to reach a high use to capacity. But Spain is running trains with different speeds on its high speed lines. Another condition for a high cost-benefitratio is a strict regular service with at least one service per hour. RENFE however is running the AVE trains in a rather irregular timetable. Some examples will be presented to demonstrate this fact. The author gives some comparisons of travel times in Spain, Japan and China. The routing data of the AVE line Madrid - Sevilla is compared with those of the Shinkansen Shin Osaka - Hakata. Based on this comparison the author proposes an upgrading of the AVE-Line Madrid - Sevilla for 300 km/h. A strict regular service for all AVE lines can be developed on the basis of a new travel time Madrid - Sevilla with 118 min together with a 142 min nonstop travel time Barcelona - Madrid. The cost-benefit analysis shows several results, above all nearly 100% more train kilometres as well as saving of running days from EMU’s and track change constructions. These results could considerably improve the cost-benefit ratio of the AVE traffic.